Monster Truck Rally is a game app. by XLab Technologies where you are a monster truck driver who is trying to gain credits so you can gain access to more trucks and tracks. You start out with 1000 credits in your truck account and with 1000 credits in your track account. The only truck you can access at first is the Total Destroyer, with the goal of eventually attaining the Monster Crusher, T-Rex Butcher, Sasquatch, and Black Mamba. They are 1800/4600/8200/12000 credits, respectively. There are five unnamed tracks, costing 1000/2000/4000/8000/12000 credits. Since the main objective seems to be to unlock trucks and tracks, I feel like the app. would be better if more of each were available to unlock. Once you choose your truck and track, you drive the truck by tilting your device to steer, pressing down on the right hand side of the screen to accelerate, and pressing the right side of the screen to brake or reverse. If you drive off course during the race, the screen will fade to black, and you’ll be put back on course where you left off. However, if you exit in the middle of the course to go to the menu screen, you cannot resume your game where you left off. Also, it is unclear how many lives you have or how long you have to complete the track within. Also, there is no credit listing available while on the track. I’m not sure if you finish the track if you are then awarded enough credits to unlock the next truck/track, or if you are awarded a certain amount depending on where you place, your time, etc. I think the game would be better if these things were clearer. A tutorial section outlining the way the game works would be great. The graphics of the game are pretty good- I appreciate the truck graphics themselves much more than the course graphics, though. The sounds and music are completely appropriate for a monster truck game- rock music, loud engines, etc. I really like the 3 different viewing options that you can change between during a race- you can see the whole truck, the truck from within the cab (with steering wheel/dash visible), or the truck from the driver’s perspective with no truck or cab visible. You can change between these by tapping “view” in the upper left hand corner of the race screen. The menu screen has multiplayer, practice, and options features. Within the options feature, you can turn auto-accelerate and tilt horizon on or off, and adjust the music volume and steer sensitivity. You can also erase data and set a nickname for yourself. Good news, this app. is being offered this week for $0.99. Although it could use some tweaks here and there, Monster Truck Rally is definitely a fun monster truck racing game. 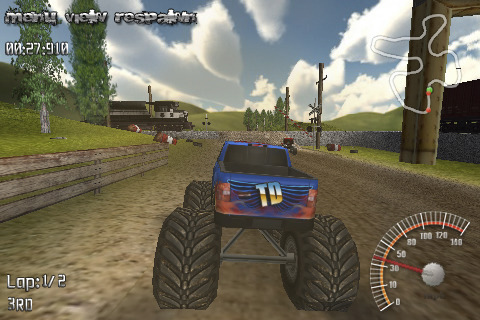 AppSafari review of MonsterTruck Rally was written by Tyne Kennedy on June 7th, 2010 and categorized under App Store, Fun, Games, Physics Based, Racing. Page viewed 5405 times, 1 so far today. Need help on using these apps? Please read the Help Page.